Found a couple of cheap cage switches on Ebay. Trimmed off the ends of the plastic housings with a cutoff disk. It would look cleaner with a new cover bezel. I don't think that the Mini switches go well with the Fiero HVAC or the overall design. Too prominent. Something elegant and unobtrusive would be better IMO. Got the model of the universal fender flare primed. 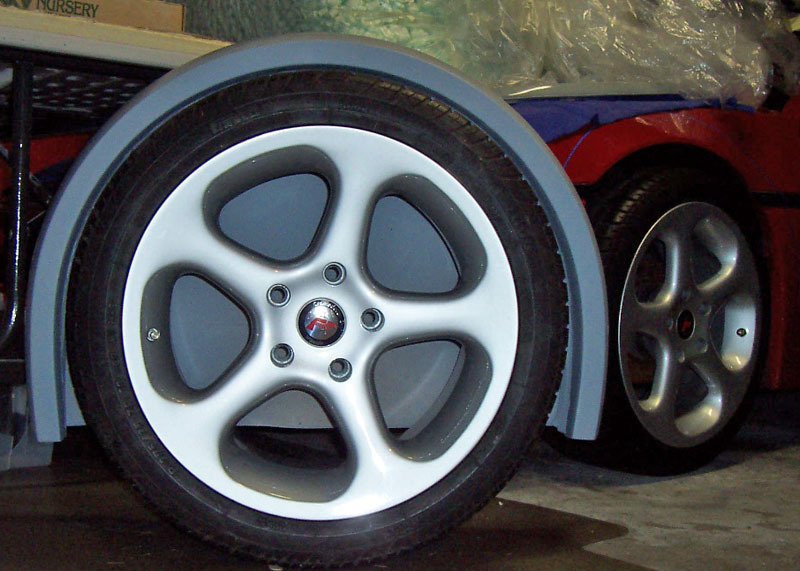 Most of it will likely be trimmed away for the front wheels since most of the width is only needed at the top. I've been wanting to do fender extensions for the front of my 88 so I can use a second set of rear 88 Black wheels up front to widen the stnce a bit. shoot me a PM if you ever have time. Thanks!! They look okay to me, but in the photo it's not seated properly...it's sticking out 1.5" because the area behind is blocked with cardboard. It will look better when I make a flush bezel with graphics. Billet buttons are simple & clean. I'm all for the billet buttons. They look great. I would need labels on my toggles so my brain won't be in a boggle. That's great! I just need to borrow it to take some measurements in order to ensure that the new G1 shifter surround can accommodate both manual & auto shifters. I already have a shifter...just need the surround. If you can send one to me in good condition that'll be great. The surround went out today. Forgot I had your address on the box for my i512 nose! G-1 updates, G-1 updates, G-1 updates! 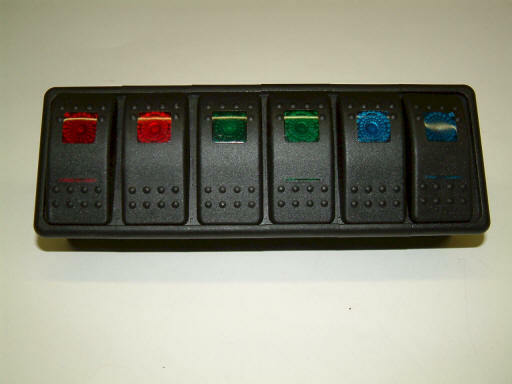 This illuminated switch panel on Ebay is more subdued. 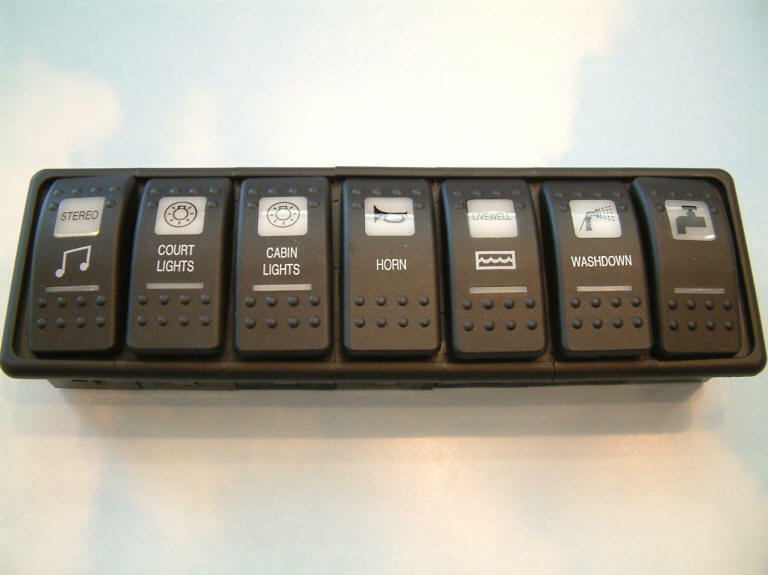 it can be used to replace the stock power windows, power doorlocks, etc. made by Carling...about $100. Glovebox from the Pontiac G6; purchased on Ebay for $25. An assembly that already has a latch & hinges. I'll see if I can design the dash around it. If all goes well, the glovebox assembly should just screw into the dash. However, the Fiero HVAC unit will create a clearance issue which will require some trimming at the back of the glovebox unless I can move it rearward enough to clear the hvac unit. Glovebox from the Pontiac G6; purchased on Ebay for $25. An assembly that already has a latch & hinges. I'll see if I can design the dash around it. That's smart thinking! I like it! No G-1 updates in a week? Withdrawal sets in...! An "F" to the "G"....harvesting mounting flanges from the donor dash. Are you still able to reproduce the F40 dash? I'm actually interested in ordering one sometime around august. Continuing the G1 dash model mockup. More adjustments to positioning & shape as I zero-in on a setup that will work best with the stock Fiero gauges and the G6 glove box. But , I've been on hold waiting for delivery of some Fiero dash parts. 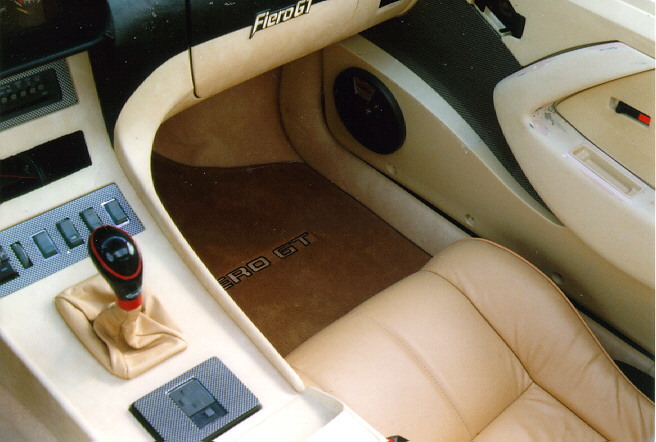 More adjustments may be needed depending on how the Fiero dash is layed out. The Fi40 dash prototype is used as a base structure providing the needed mounting flanges. The G6 glovebox assembly will work with this dash, but it is very close to the heater unit and I will likely have to trim the back of the box a little to get more clearance to position the box better. Yes, I still have the tooling for the Fi40 dash. Have you ever made a custom dash, takin the current like the 355 then adding ideas onto it? Awesome, awesome, awesome! Want, want, want! Just curious, with the laid back windshield, would this design work in a choptop ?? 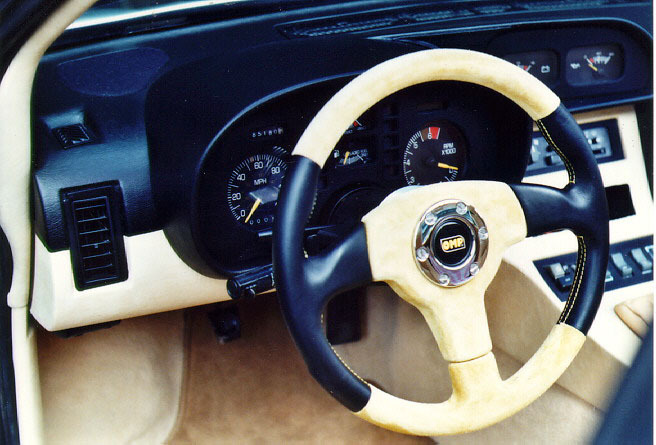 I would say that if the stock Fiero dash fits in a chop top then the G1 dash should also fit. How much leg room/cabin room do we lose with the glove box? How does the room behind the dash change in that area? Do we gain/lose additional room? Maybe a great area for someone to mount an 8", or 10" subwoofer, should they choose to. While this may be a niche market, it may be interesting how this dash looks with the AD 355 7" extended windshield, or the Sebring windshield, and the tray that goes with it. did you get the dash I sent you? I may try a one-off someday for my own car. There is a slight overlapping condition between the left factory speaker grill & the G1 instrument pod. The simplest thing to do is to just keep it as is, but I'm thinking of notching the grill to eliminate the overlap. 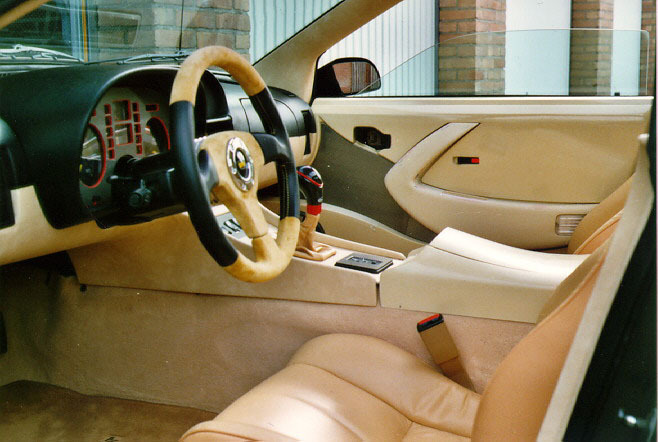 But, it may depend on whether the speakers are mounted from above or below the dash. If the factory speaker can be under mounted then I'll be able to notch the grill opening. Preserving the shape of the G1 instrument pod model with fiberglass mat before the cardboard & glue comes apart & the model collapses. Love the G1 dash so far keep the updates comeing. Being as this is an updated dash any thought to adding a cup holder? Yes, the most likely place to put a cup hold would be back on the armrest. However, that would be up to the individual to do the fabrication as the G1 dash will go as far back as the shifter surround. 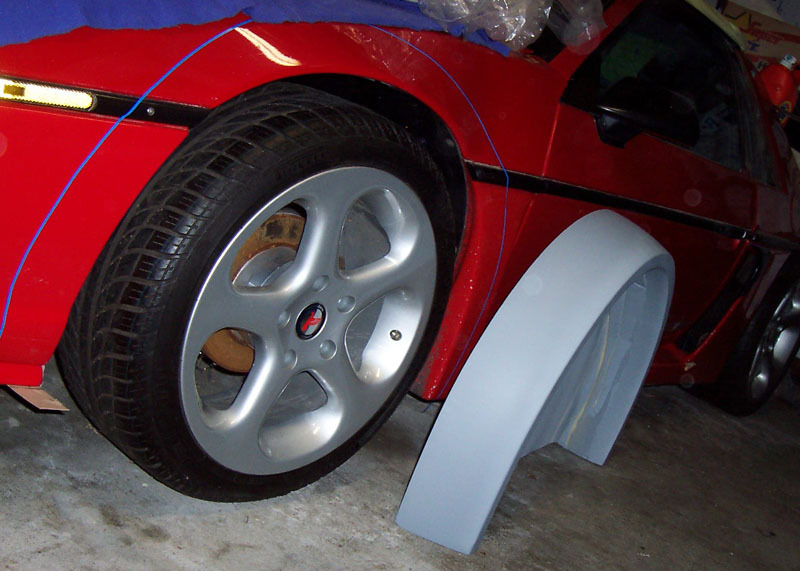 It will be designed to go with the stock Fiero armrest. The other option would be to purchase a cup holder accessory at your local auto parts store. More preliminary mock up of the G1 dash model. Dialing in on an ideal fitment of the G6 glovebox. The instrument pod is working well with the stock Fiero gauge panel. Trimming off the corners of the panel really helps to make this possible. The pod can also accommodate after market gauges as well. At more "mortal" price ranges the e46 interior, with an aftermarket stereo always looked clean. Notice the toggle switches by the e-brake. That's exactly the spot where the Fiero switches are.